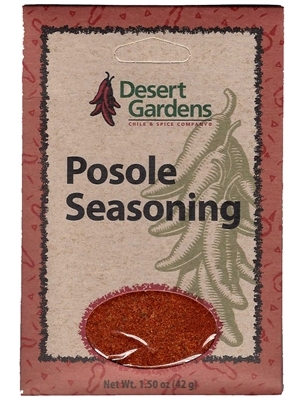 Red Chile, green Chile, garlic and more all go into this genuine Mexican style spice blend, Desert Gardens Posole Seasoning mix. Add to your posole and lean pork, simmer and get ready for unequaled Southwestern flavor! Bring 8 cups of water to a boil. Add posole and pork. Simmer covered for 2 hours. Add spice packet and cook an additional 10 minutes. Serving suggestion: top with cheese and a touch of fresh cilantro. Salt, dehydrated onion, red chile, garlic, black pepper, cumin, green chile, oregano, basil, spices.